One thing I like to do as part of my applications that are running is to have an information page that gives some basic information about the runtime environment the application is running under. I find it useful especially these days with SDKs and runtimes switching so frequently that I can quickly determine what versions the application actually runs under and where it's hosted (Window/Linux/container) without having to actually look at the source code. This should be easy right? Well, it may not be difficult, but obvious it is not. You would think it would be easy to get runtime version information - after all the runtime is... well... it's running. But nooooo... Microsoft has never made it easy to get proper runtime version information that's suitable for display in an application. Hell, in full framework you had to resort to checking the registry and then translating magic partial version numbers to an official release version number (like 4.7.1). You know you're doing it wrong when you can't tell what version of a runtime you have installed without looking in the registry and looking at an obscure lookup table to resolve the actual version everyone expects to look at. This trend continues in .NET Core. There's no direct API that returns a version number like 1.1, 2.0 or 2.1 etc. Because why make the obvious easy? There are lots of APIs that you might think would work but they either don't return anything or return some unrelated version number like the system installed full framework version - but not the one of the actual running runtime. and the project build process turns that into an attribute attached to the startup assembly. Sadly that value very usefully returns null. Use the force wisely, Luke! OK, so now you can get the version number, but you should be wary of using it for anything other than displaying it for reference information. Version numbers are not really meant to be used for feature detection or other application critical comparisons, so use this version number only in cases where you absolutely have no other way. 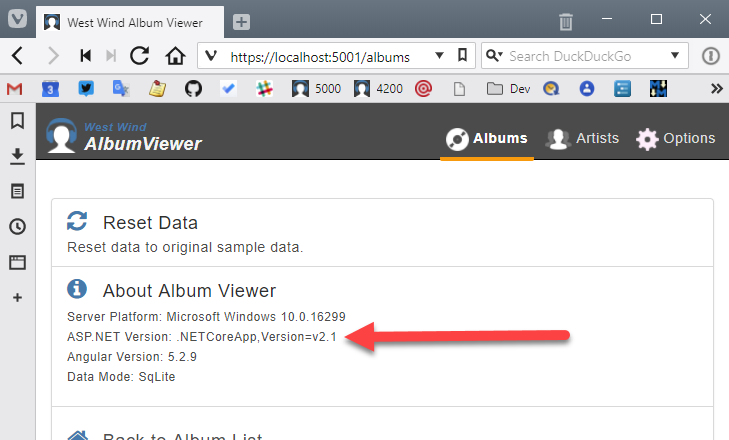 I suspect this is one of the reasons the .NET teams refuse to build runtime version numbers directly into the frameworks. Personally, I tend to use compiler directives to differentiate broad feature 'versions' - I've talked about this a bit in my previously posts on building components that target both full framework and .NET Standard. This works great for broad frameworks, which in most cases is all you need to differentiate for, but can also be used for more specific targets. Version detection in .NET Runtimes is not obvious for most versions and there's no direct built-in way to get a friendly description of the version you're running. With Minor-Version Roll-forward coming in Core 2.1, the target framework you built the app for may not be the one it eventually finds itself running on. @Bruce, MV10 - exactly my point. The runtime should provide this info so we don't have to spelunk around and hack at this. There should be a way to know what the actually running runtime instance is. A few days ago while trying to capture this information to report to Sentry.io I started a library called Sentry.PlatformAbstractions on GitHub. That is a work in progress but there's some functionality running already on the current SDK version. So far, regarding Runtime, it can report: .NET Framework 1.0 to 4.7.2 and .NET Core (if not self contained) and Mono. There are screenshots (at the bottom) of this blog post. The goal is to add better more OS information (report not only Linux and kernel but which distro and for Windows, if it's Server edition or not). Everything is open source and help would be very much appreciated! Wonder if these can be mapped to .net core runtime versions.